March is Women's History Month, and this year's theme is Women in STEM. As part of my university's festivities, we had a panel discussion entitled, "Lipsticks and Lab Coats: Women’s Challenges and Journeys in STEM." Despite not being a wearer of either lipstick or a labcoat, I was invited to participate on the panel, and got a free lunch out of the deal. The discussion touched on many of the issues that I've come to be very familiar with through my involvement with CSWA: unconscious and conscious bias, gender policing, lack of support for childcare, leaky pipelines, trying to lead while being a woman, two-body problems, and work-family balance, just to name a few. I have to remind myself at events like these that although I feel like I'm re-treading the same ground over and over again in discussing these issues, that's not true for everyone. One of the things that I truly appreciated and enjoyed about the panel was hearing about all the panelists' journeys to where they are today. We were asked to discuss not just the challenges we faced along the way, but also why we loved our jobs and what skills and strengths helped us in our paths. It reminded me of why I became a scientist: the love of discovery, of exploration, of problem-solving. At the same time, there were several of us who could speak to being the lone woman in her department at some point along the way. 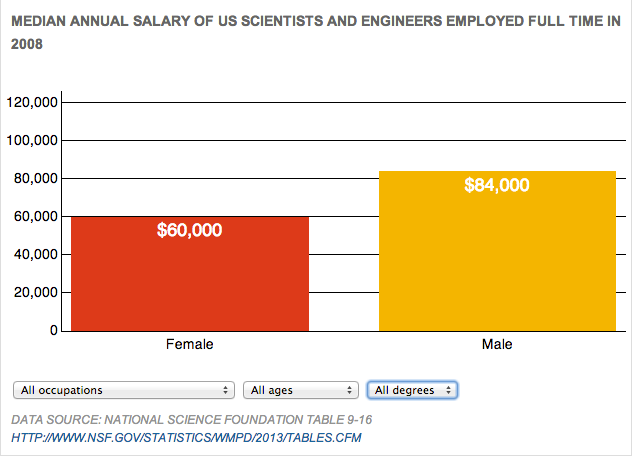 Despite all our talents and skills, there's a real lack of senior women faculty in our university. Many of our departments have achieved gender balance, or nearly so, among our graduate students, but our women students have few role models because of the lack of gender parity in the faculty. Solving that issue is going to take more than a panel discussion, however. For my own part, I've been hosting a Women in Physics and Astronomy Tea on a semesterly basis. The next one will be a little late for Women's History Month, but better late than never. I'm doing my best to be a role model for these students, by showing them by example that they can do what they love and get a successful career out of it, and their gender doesn't have to get in the way. Today's guest blogger is Annika Peter. Annika studies dark matter and gravitational dynamics and is currently finishing up a postdoctoral position at UC Irvine. She is moving to a faculty position in the Departments of Physics and Astronomy at The Ohio State University. -The NSF funded ADVANCE (Increasing the Participation and Advancement of Women in Academic Science and Engineering Careers) programs at a suite of universities. -Information on UC Irvine’s ADVANCE Program can be found here. A recent Nature article discusses problems with the hiring and retention of women in science and engineering. The National Science Foundation finds that while female scientists have made steady gains in recent decades they face persistent career challenges. 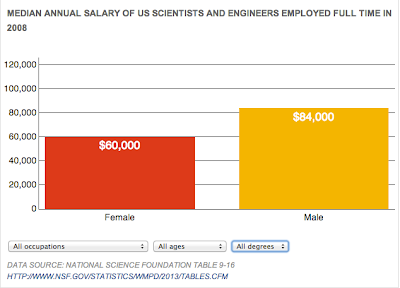 US universities and colleges employ far more male scientists than female ones and men earn significantly more in science occupations. 3. Is There Life After Work? [T]here is one sentence in your piece that grabbed my attention, and I would argue brings up a point far more substantive than grammar and political correctness: "One grumpy, misogynistic tenured faculty member can cause many difficulties, but he cannot prevent change." Women who are overtly against proposals to improve the status of women swing a disproportionate and often unrecognized amount of power: the dissent of only one women is quite enough to sway the votes of otherwise well-intended men, who correctly reason that on this subject, a woman has more experience. Of course, we must not discount the possibility that the woman's reasoning and view, even if in the extreme minority, is entirely correct in some or many cases, and the males just don't see this! But no one of either gender has infallible judgement plus a crystal ball, and in the admittedly limited number of situations I've personally experienced, hindsight of years later showed that the proposed action to improve the status of women, opposed by a woman, turned out to be correct. So your quoted sentence can be taken by many as a none-too-subtle claim that only males are a problem in advancing the status of women in academia, and at some level I offer friendly disagreement. My colleague is right to challenge any implication that men are the only problem (although this was not the intent of my statement). Women can retard departmental efforts toward gender equity equally or moreso to men not only because their personal experience carries weight, but also because to oppose them could be viewed as an attack on women, which those seeking to advance the status of women are trying to avoid. I have rarely seen this happen. When it does, how should one - a senior colleague, a departmental leader, or a junior colleague - respond? One might try to shift the focus away from gender and towards inclusion and respect for all. How best to do so in such cases is a good question, for which I seek advice from readers of this column. This blog is close to home for me, from University of Maryland. It is about a study by UMd faculty member Waverly Ding showing the lack of women on corporate boards. Along with co-authors Fiona Murray of MIT and Toby E. Stuart of University of California Berkley, she analyzed survey data of 6,000 U.S. scientists in the biotech industry over a career span of 30 years. In a paper in the Academy of Management Journal, they find that women at the professorial rank are almost 50% less likely to serve on corporate boards and start new companies than equivalent men. The study included controls for professional accomplishments and other academic factors to make the best possible apples-to-apples comparison. About 30% of PhD earners in this field are women, but only 7% of those women serve on corporate boards. This percentage on boards is about half that of that for male scientists. Board membership is particularly important in this area of science because research is often tied to corporate needs and funding. "Beliefs that women lack leadership and business savvy, and are not capable of helping new ventures attract investment, block their advancement in these areas", according to Dr. Ding. The Feminine Mystique by Betty Friedan has been called the book that changed the consciousness of a country—and the world. Originally published in 1963, this trailblazing book that changed women’s lives is still just as relevant 50 years later. For the first time in my academic career, I spent Spring Break at the beach. I took not only The Feminine Mystique, but also A Room of One’s Own and The Mercury 13. I came away with a healthy dose of 20th century feminism as well as inspiration. Betty Friedan not only informed me of things I knew little about (the shift backwards in the Women’s Magazines from stories about “Career Women” in the 1930s and 40s to stories about the “Happy Housewife” in the 1950s and 60s; the Madison Avenue campaign to make women fall in love with household appliances), but also put into perspective the issues I was familiar with (the Seneca Fall Women’s Rights convention; the college “Mrs. Degree”). The book is also very well written. If you are headed to the beach this spring, or even if you’re not, The Feminine Mystique is worth a read. A number of studies indicate that, at the faculty level, a large proportion of women physicists and astronomers are partnered with other academic scientists (especially other physicists!). The exact numbers are hard to come by---a lot of the time, all physical scientists are lumped together in studies, even though there are hints that there are major differences across fields (with Stanford’s Clayman Institute for Gender Research finding that physicists have the most “endogamous” marriage habits). I have found only one survey specific to physicists, and it is not especially recent (1998 to be specific). Moreover, I have not yet been able to find cohort studies that examine family structures at a variety of career stages, or studies of the reasons why both men and women leave the academic track. I am also interested to see if there is greater or lesser selection pressure on dual academic couples. In my experience, a high percentage of women in physics and astronomy are coupled with other academic scientists at just about all career stages, but I would like to see some cold, hard numbers on this. 5. First time away from the kids? Whoop it up! 7. The Finkbeiner Test: What Matters in Stories about Women Scientists? 9. Should we replace work-life-balance with autonomy? A few weeks ago, for almost 48 hours, I didn’t grade, read, or think (much) about department issues. Crazy, huh? The semester had just started and I should have been preparing new class lecture notes, finishing up projects from the past semester, or otherwise trying to “pre-organize” so that I don’t feel like I’m putting out proverbial fires every day over the next few months. But that weekend? Forget it. That weekend was for me - and a few of my girlfriends. Today’s guest blogger is Evgenya Shkolnik. Evgenya is a tenure-track astronomer at Lowell Observatory, where she studies exoplanets, young low-mass stars, and star-planet interactions. She also is the mother of three young children: Reuben (age 6), Sima (age 4), Leona (age 1.8). Below is an email exchange Evgenya had recently with her friend Kim, a geophysicist. I need advice/help from a veteran. In two weeks, I'll be heading out to Dublin for a week-long conference and leaving my kids for the first time ever. I'm not too concerned about Sam but I'm worried about how Beatrix is going to deal with my absence. She's almost 2 so won't really understand that I'm just temporarily away. How have your littlest ones coped when you've been away? Any tips? Colin will be with them and I've got my Mom coming out to stay while I'm away so I'm hoping that offers enough distraction. Also, Beatrix still nurses a few times a day so I'm worried that my absence will be traumatizing. And, how do you personally cope with being away from your kids for extended periods? I'm missing them already and I haven't even left yet!! I think I'm going to need therapy after this! Any words of wisdom, or consoling, are greatly appreciated. Many of us received the following email from the AAS, containing a letter from David Helfand (AAS president) about hiring practices. I thought I'd repost it here, to provide a space for discussion about this topic. Should we revamp our letter of recommendation system? Should we set a deadline for faculty positions as we do for postdocs (Feb 15)? Should departments cut down on the number of in-person campus interviews? How can we create a more sustainable relationship between the number of PhDs and the job opportunities available? What support should we be providing to better prepare our PhDs for the full range of interesting careers? For a significant fraction of our membership, February is probably not their favorite month. Despite being the calendrical midget with the smallest number of days, for those on the job market it probably produces the largest amount of anxiety. Indeed, the entire job search process seems to consume a larger number of months, a larger expenditure of resources, a larger amount of time, and a larger quantity of emotional energy than it did the last time I applied for a job 36 years ago. Should we reduce this burden? And, if so, how do we go about doing that? I certainly don't know the answer(s), but I think it is time to start asking the question(s). AASWomen mentioned a thoughtful, short (< 5 minute) video in this Friday's newsletter. It contains a few nuggets of wisdom I wanted to highlight, to help kick off the week on the right foot. 5. What does it mean to be smart? 6. Men and Women, Like Totally, Talk Differently?